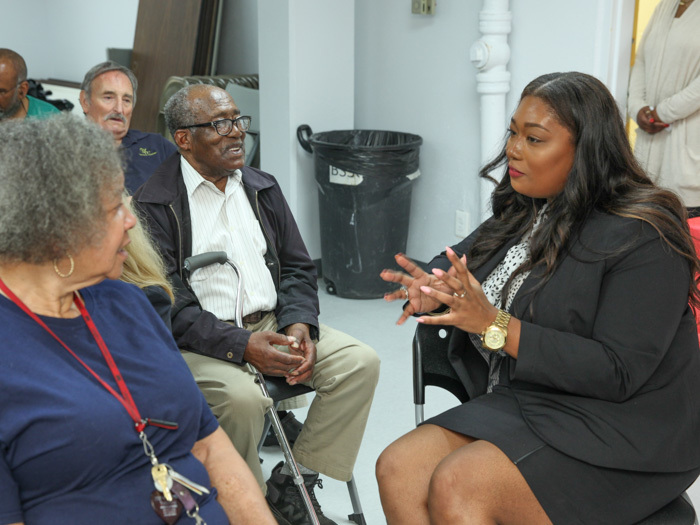 Bank of Labor Business Development Officer Alicia Paige offers advice to participants in the Senior Crimestoppers Program. Bank of Labor Senior Vice President, Labor Marketing Development Bridget Martin listens to concerned residents. IT’S UNFORTUNATELY NOT uncommon for senior citizens to fall victim to devastating financial scams. That’s why Bank of Labor, the nation’s only labor majority-owned and -operated bank, launched a Senior Crimestoppers program in two Washington, D.C.-area locations this past April. Residents and staff of the Green Valley Apartments and Little Sisters of the Poor were the first program participants to learn proactive measures to avoid becoming scam victims. Union Boilermakers, who were in the D.C. area for the annual LEAP Conference, attended the events as part of the kick-off. According to the MetLife Mature Market Institute, each year, nationwide, more than two million senior citizens are taken advantage of in financial scams. The impact is estimated at about $2.9 billion. Bank of Labor, which is funding the Senior Crimestoppers program, co-sponsored the initial Washington, D.C. events with CRA Partners. In addition to ongoing education about avoiding scams, the program includes cash rewards up to $1,000 for anonymous information about suspected wrong-doing and provides personal lockboxes for residents. The program has reduced all aspects of crime in similar participating facilities by 94 percent. Bank of Labor plans to host future Senior Crimestoppers programs that will be open to the public, based on consumer demand. More information can be found at www.bankoflabor.com.